You need high-quality, self-adhesive labels for your honey jars? At label.co.uk, there are no limitations on label size and shape, material, variation and finishing. Your adhesive honey labels are produced using high-quality digital printing exactly to your specifications. Design your individual labels according to your idea. We produce your labels using a four colour printing process and also offer premium embellishments such as hot foil stamping and film lamination. Using the Online Calculator you have the possibility to order several varieties of honey labels at once. As long as format and material do not differ, we can produce numerous varieties in one run. Producing multiple varieties at once is more cost-effective for both you and us because we only have to set up the presses once. 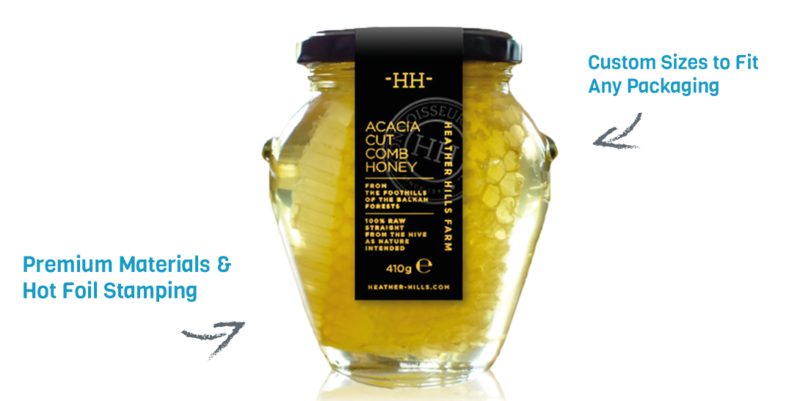 For example, combine different designs for front and back labels, labels for your organic honey and raw honey, or for your heather honey and new limited edition honey. Especially for small businesses and self-marketers, this combination can quickly pay off. Take a look at our material selection and review some of the different finishes you can choose from. Our practical Sample Book with numerous sample labels printed on our standard materials is a great tool. Convince yourself of our print quality and be inspired by the different finishes. It’s a completely free tool for brand and businesses of all shapes and sizes. Label artwork always has been and always will be a key part of the label printing process; honey labels are no exception. For business who do not have resources to ensure their artwork is print-ready, we have a range of Artwork Services available. There are many reasons as to why your business may need to see a press-proof before placing a full custom label order of honey labels. We’ve developed a range of cost-effective proofing services. Need your honey labels fast? Standard lead times are 5-7 working days. However, we understand that from time to time businesses require their custom roll labels faster. Our Express Production ensures production within 24-48hrs.